Of all the parts that make up a bicycle, the drive chain is among those that receive the most wear. The chain is almost always in motion and under constant tension, bearing against other parts in the drive train. The chain is also open and exposed to any elements that can damage it, including water and dirt. Proper lubrication of your bicycle chain will help it to operate properly and also protect the rest of the drive train, including the derailleurs, crank set and rear wheel gear assembly, from additional wear. If you are a frequent rider, using your bike several times throughout the week, your bicycle will benefit from a regular cleaning and lubrication of the drive chain. 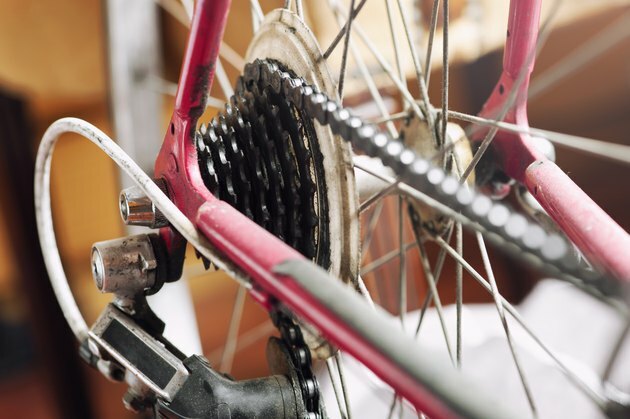 Bicycle Tutor recommends cleaning and lubricating your bike's drive chain at least once every month to maintain optimal performance and protection. Lubricate your bike drive chain immediately after use if you are riding in challenging conditions, such as mountain biking in dirty terrain or riding in the rain or other wet conditions. Also, clean and lubricate the drive chain on your bicycle if you notice it becoming dry, sounding noisy or if the chain links bind in any way. Using the proper lubricant will ensure the chain works correctly and can help to extend the life of the chain. Household spray lubricants are too thin and can actually dry out bicycle chains. Vegetable-based oils are a poor choice as these become gummy. Motor oils are too thick and do not penetrate the chain thoroughly. A mineral-based lubricating oil, specifically designed for bicycle parts is the best choice. To lubricate your bike chain, wipe the entire length of the chain with a clean rag to remove any dust, dirt or debris. Clean the chain rings on the front crank set and the gear assembly on the rear wheel hub. Apply the lubricant to the inner surface of the entire length of the chain. Turn the pedals and shift through all the gears to work the lubricant into the links of the chain and the other parts of the drive train. What Type of Oil for My Bicycle Chain?